FEDERATED Federated Mission Networking is a key contribution to the Connected Forces Initiative (CFI), helping Allied and Partner forces to better communicate, train and operate together. MISSION FMN enables a rapid instantiation of mission networks by federating NATO organizations, NATO Nations and Mission Partner capabilities, thereby enhancing interoperability and information sharing. NETWORKING Federated Mission Networking is a governed conceptual framework consisting of people, processes and technology to plan, prepare, establish, use and terminate mission networks in support of federated operations. Federated Mission Networking is a capability aiming to support command and control and decision-making in future operations through improved information-sharing. It provides the agility, flexibility and scalability needed to manage the emerging requirements of any mission environment in future NATO operations. Federated Mission Networking is based on principles that include cost effectiveness and maximum reuse of existing standards and capabilities. It consists of three elements: -> Federated Mission Networking Governance, -> Federated Mission Networking Framework and -> Mission Networks. Federated Mission Networking will be based on trust, willingness and commitment. Federated Mission Networking is built on lessons learned from the Afghanistan Mission Network (AMN) implementation and on the NATO Network Enabling Capability Programme. Federated Mission Networking GOVERNANCE sets objectives, defines the regulatory framework and environment (rules, procedures, policies, standards etc.) and helps ensure responsible use of resources and management of risk. 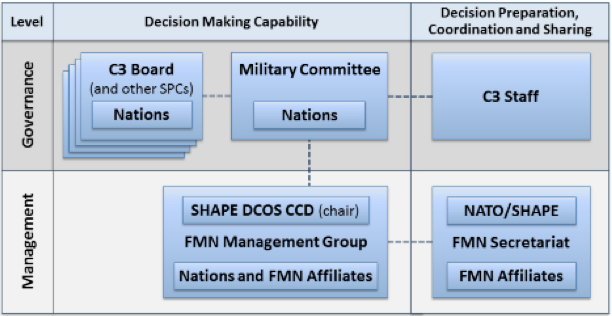 Executed by the Military Committee, the governance level provides direction for the supporting management bodies executing management functions for the FMN Framework and for each Mission Network and for the Federated Mission Networking Affiliates. The management level translates the direction provided by the Military Committee into strategies and plans, which in turn are translated into action by Federated Mission Networking Affiliates. The performance is reported back to the governance level, who subsequently evaluates the performance and incorporates it in adjustment of expectations. The working groups constitute mutually supporting and complementary Federated Mission Networking assets, empowered to liaise directly with other NATO bodies and entities and the native organizations of affiliates as required. 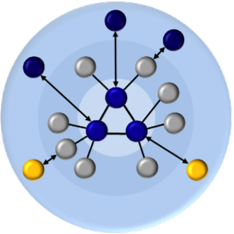 The Federated Mission Networking FRAMEWORK is a governed, managed, all-inclusive structure providing a permanent ongoing foundation with processes, plans, templates, enterprise architectures, capability components and tools needed to prepare (including planning), develop, deploy, operate, evolve and terminate Mission Networks. Instantiate and Manage a Mission Network Instance. MISSION NETWORKS provide a governed single instance of capability, including the Communication and Information Systems, management, processes and procedures created for the purpose of an operation, exercise, training event, or interoperability verification activity. Mission Networks are established using a flexible and tailored set of non-material (i.e. policy, processes, procedures and standards) and materiel (i.e. static and deployed networks, services, supporting infrastructures) contributions provided by NATO, NATO and non-NATO nations and entities. A Mission Network Element contains Networking and Information Infrastructure and services for self-provisioning, including sufficient mission essential services. Other Entities are not integral part of the network, nor are they subject to Federated Mission Networking Framework requirements. NATO and national engagement in the overall effort and representation in the working groups facilitates collaboration and ensures quality of effort. NATO organizations, NATO and Non-NATO nations are encouraged to become Federated Mission Networking Affiliates, which implies they will maintain and further develop capabilities for federated mission networks and ensure Communication and Information Systems security and interoperability compliance with Federated Mission Networking standards and principles. Federated Mission Networking Affiliates will be able to contribute Federated Mission Networking-ready forces to a mission on short notice and with minimal preparation.